This month’s agenda for the Historic Preservation Commission includes a request to demolish the granite retaining wall along the sidewalk at 110 South Mendenhall Street. The wall has been leaning noticeably toward the street for years. Berkley’s response is to seek a Certificate of Appropriateness to demolish the wall. 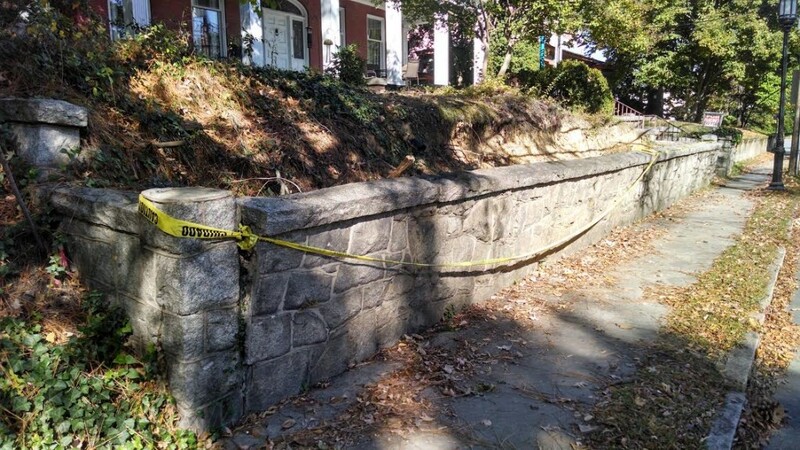 Retaining walls are covered in the City of Greensboro Historic District Program Manual in a section beginning on Page 24. The application will be discussed at the College Hill Neighborhood Association’s monthly meeting on Monday at 7 p.m., at the Presbyterian Church of the Covenant, 501 South Mendenhall Street, in the Fellowship Hall. The HPC meeting will be held Wednesday at 4 p.m. in the Melvin Municipal Office Building, Plaza Level Conference Room. Also on the agenda is an application for landscaping and site improvements at 817 Rankin Place. This entry was posted in Carr Street, Historic Preservation, Mendenhall Street, Walker Avenue. Bookmark the permalink.